Summary: Dry and warm weather continues. Rain chances are slowly creeping up on us by the end of the weekend. 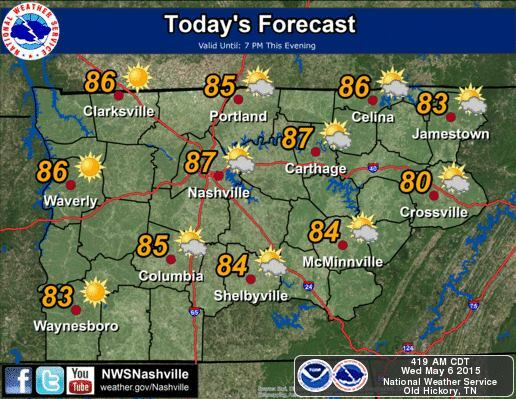 Today, expect the high temperature to be 83 degrees under mostly sunny skies. Winds will be out of the south southeast at 5 to 10 mph. Tonight, temps fall to about 58 degrees with a few clouds in the sky. Winds start to calm down overnight. Thursday looks to be a little warmer than today, with a high temp of about 87 degrees. Some clouds will be in the sky but it will be mostly sunny. Winds will be 5 mph out of the south. 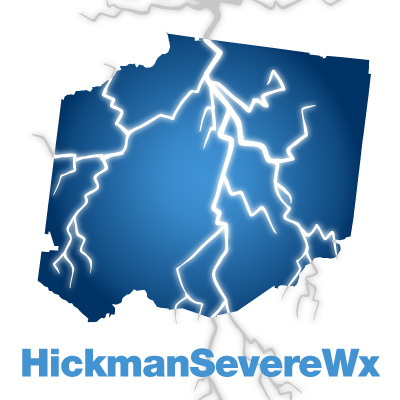 The NWSNashville is saying we might see a very isolated rain shower every day from now on, but count yourself lucky if it rains on you until we get into the weekend. Any rain/thunderstorms that will develop between now and the weekend should be short-lived and due to the heating of the day. The weekend will be very pleasant for Moms, with a slight chance of rain. With Mother’s day this weekend, everyone is wanting to know if we’ll be seeing any rain that could ruin any plans with our Moms. Currently, both Saturday and Sunday hold a 20% chance of rain and thunderstorms as we go about our weekends. 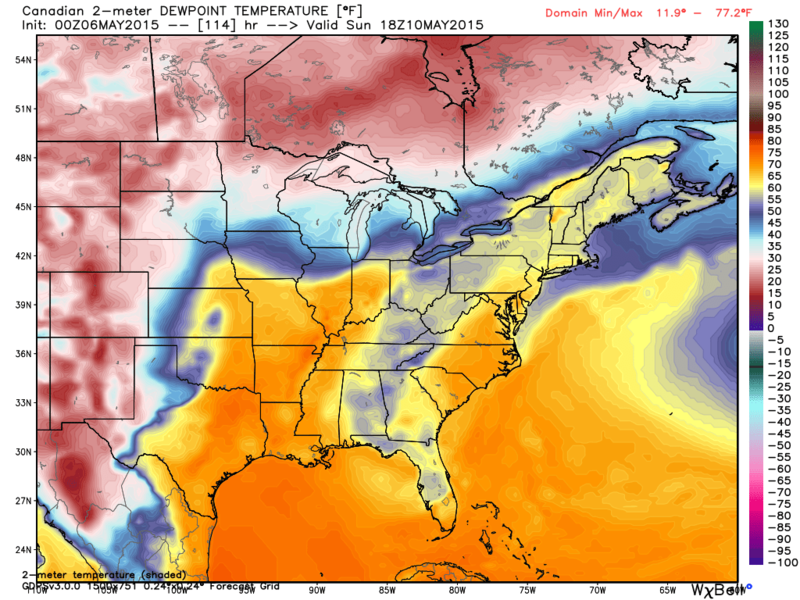 This will likely be from daytime heating mixing with high dew points (read next paragraph). 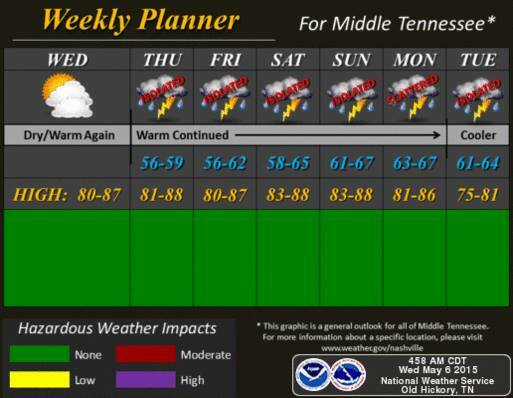 The high temps will be mid 80’s both days. Humidity, however, will be on the rise. Below is the Canadian Dew Point model for Sunday at 1pm. The yellows/oranges/reds indicate dew points between 60 and 80 degrees (translation: you’re gonna sweat, and sweat a lot). This also helps add a little bit of energy for daytime heating thunderstorms (which is why there is a 20% chance of rain).